Microalgae are a promising feedstock for biofuel and bioenergy production due to their high photosynthetic efficiencies, high growth rates and no need for external organic carbon supply. In this study, utilization of Chlorella vulgaris (a fresh water microalga) and Dunaliella tertiolecta (a marine microalga) biomass was tested as a feedstock for anaerobic H2 and CH4 production. Anaerobic serum bottle assays were conducted at 37°C with enrichment cultures derived from municipal anaerobic digester sludge. Low levels of H2 were produced by anaerobic enrichment cultures, but H2 was subsequently consumed even in the presence of 2-bromoethanesulfonic acid, an inhibitor of methanogens. Without inoculation, algal biomass still produced H2 due to the activities of satellite bacteria associated with algal cultures. CH4 was produced from both types of biomass with anaerobic enrichments. Polymerase chain reaction-denaturing gradient gel electrophoresis profiling indicated the presence of H2-producing and H2-consuming bacteria in the anaerobic enrichment cultures and the presence of H2-producing bacteria among the satellite bacteria in both sources of algal biomass. H2 production by the satellite bacteria was comparable from D. tertiolecta (12.6 ml H2/g volatile solids (VS)) and from C. vulgaris (10.8 ml H2/g VS), whereas CH4 production was significantly higher from C. vulgaris (286 ml/g VS) than from D. tertiolecta (24 ml/g VS). The high salinity of the D. tertiolecta slurry, prohibitive to methanogens, was the probable reason for lower CH4 production. Photosynthetic biomass-based fuels are widely considered as viable contenders as sustainable alternatives to fossil fuels. Currently, the major share of biofuels and other forms of bioenergy are produced from terrestrial plants . Microalgae may prove an alternative to terrestrial crops because they have higher photosynthetic efficiencies, higher yields and growth rates, and fewer requirements for cultivation land and they can be grown in saline waters and in arid and barren land areas [1, 2]. Microalgal biomass is potent for anaerobic conversion as it can have a high content of lipids, carbohydrates and proteins, and does not contain recalcitrant lignin [1–3]. However, the robust cell walls of some microalgal species may limit digestibility [4, 5]. Anaerobic digestion of microalgal biomass for CH4 production has been studied at various temperatures and with various pretreatments and cosubstrates [4, 6–9]. For example, Chen and Oswald  reported that pretreatment of algal biomass at 100°C for 8 h increased digestibility by up to 33%, but the energy consumed in pretreatment was higher than the enhancement gained in CH4 production . Some green microalgae, such as Chlamydomonas reinhardtii  and Chlorella salina  produce hydrogen under anaerobic conditions via direct photolysis . However, despite extensive research this process has low yields and is rather feeble. It is filled with metabolic and technical obstacles  and remains an unlikely source of sustainable energy. Indirect photolysis of microalgal biomass by first hydrolyzing the biomass with lactic acid bacteria followed by photosynthetic H2 production resulted in H2 yields up to 8 mol H2/mol starch glucose from C. reinhardtii (66% starch conversion efficiency) . Carver et al. reported H2 production from dark fermentation of Chlorella vulgaris and Dunaliella tertiolecta at 60°C. Further, Gfeller and Gibbs , Miura et al. and Ueno et al. reported hydrogen fermentation by microalgal cells under dark, anaerobic conditions. The aim of this study was to examine the formation of H2 and CH4 from microalgal biomass. Two green microalgae, Chlorella vulgaris (a freshwater species) and Dunaliella tertiolecta (a marine species) were used as feedstocks. Experiments were carried out in batch bottles at 37°C without pretreatment of the algal biomass, and the microbial communities were characterized by polymerase chain reaction-denaturing gradient gel electrophoresis (PCR-DGGE) profiling of 16S rRNA gene and sequencing. The chemical composition of the two microalgal biomass feedstocks was different. C. vulgaris contained 36%, 13% and 8% of proteins, lipids and sugars on a dry weight basis, respectively. The corresponding mass composition of D. tertiolecta was 15%, 11% and 4%, respectively. In general, these values are lower than previously reported in the literature (Additional file 1, Table S1). The compositional data for D. tertiolecta in particular may reflect loss of cellular constituents upon sample preparation and handling because the marine microalga does not have a rigid wall and is prone to lyse when the osmotic pressure changes. Growth conditions were not varied to determine the corresponding changes in cellular fractions. Four different cultures were enriched from the initial anaerobic digester sludge. Two H2-fermenting cultures, one with C. vulgaris biomass, designated as B-C, and one with D. tertiolecta biomass as the substrate, B-D, and two CH4-producing cultures, one utilizing C. vulgaris biomass, U-C, and one D. tertiolecta biomass, U-D. Methanogenesis was suppressed in the H2-fermenting cultures by addition of 20 mM 2-bromoethanesulfonic acid (BESA). During enrichment phases 1-5 no H2 was produced in any of the cultures, while in enrichment phases 6 to 9 low levels of H2 were detected in B-C and B-D enrichments during the first few days, but usually by day 5 the H2 level had decreased below detection limit (results not shown). No CH4 was produced in the cultures with added BESA (Figure 1). Methane production during the enrichment. Methane production (± SE) in enrichment phase 1 (A), 2 (B), 3 (C), 4 (D), 5 (E) and 6 (F) where closed circles = Chlorella vulgaris and U-C, closed squares = C. vulgaris and B-C, closed triangles = Dunaliella tertiolecta and U-D, and crosses = D. tertiolecta and B-D. H2-fermenting cultures (with 20 mM BESA): C. vulgaris biomass as substrate = B-C; D. tertiolecta biomass as substrate = B-D; CH4-producing cultures: C. vulgaris biomass as substrate = U-C; D. tertiolectabiomass as substrate = U-D. Crosses do not show, because they overlap with closed squares. With U-C and U-D, the CH4 production was higher from D. tertiolecta biomass than from C. vulgaris biomass in the first enrichment phase when tested with a combination of 25% algal biomass and 75% activated sludge (Figure 1A). From phase 2 onwards, when the proportion of algal biomass in the substrate was increased to 50% or higher, CH4 production from C. vulgaris surpassed that from D. tertiolecta (Figure 1B-F). With 100% C. vulgaris and D. tertiolecta biomass the rates of CH4 production ranged between 3.4-6.5 and 1.2-4.9 ml/day and the lag times between 2.6-5.1 and 5.3-10 days, respectively. The CH4 yield and CH4 production rate decreased and the lag time increased from D. tertiolecta as the enrichment proceeded. The CH4 yields from C. vulgaris remained more or less constant after enrichment phase 4 (Figure 1). 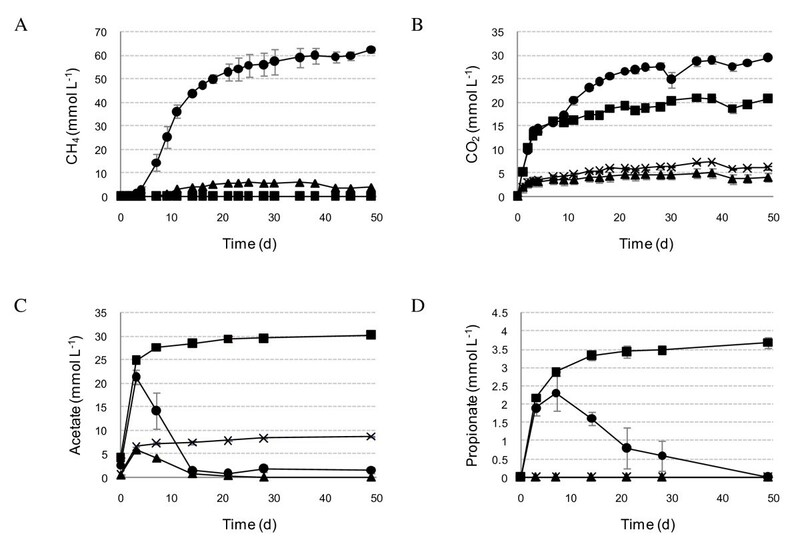 Gas production potential from C. vulgaris and D. tertiolecta was studied using the enrichment cultures after nine passages. Some CO2 was produced in all bottles indicating degradation in all cultures, including all controls with no anaerobic inoculum (Table 1, Figures 2B and 3B). 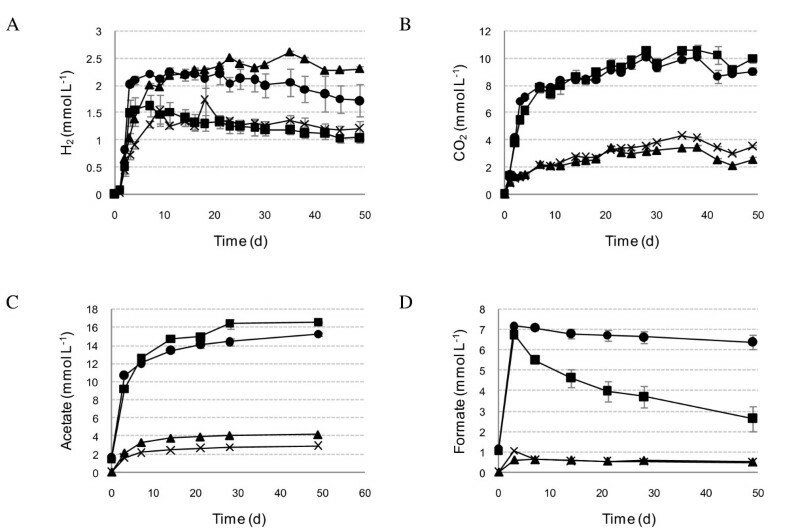 CO2 production was higher from C. vulgaris compared to D. tertiolecta. A minus sign in front of sum of VFA and alcohols indicates that the sum of VFA and alcohols was higher on day 0 than on day 49. The values include standard errors. H2-fermenting cultures: C. vulgaris biomass as substrate = B-C; D. tertiolecta biomass as substrate = B-D; CH4-producing cultures: C. vulgaris biomass as substrate = U-C; D. tertiolecta biomass as substrate = U-D.
BESA = 2-bromoethanesulfonic acid; VFA = volatile fatty acids. Metabolite production in cultures with the anaerobic enrichment inocula. CH4 (A), CO2 (B) and the main fermentation products acetate (C) and propionate (D) where closed circles = Chlorella vulgaris and U-C, closed squares = C. vulgaris and B-C, closed triangles = Dunaliella tertiolecta and U-D, and crosses = D. tertiolecta and B-D. H2-fermenting cultures (with 20 mM BESA): C. vulgaris biomass as substrate = B-C; D. tertiolecta biomass as substrate = B-D; CH4-producing cultures: C. vulgaris biomass as substrate = U-C; D. tertiolecta biomass as substrate = U-D.
Metabolite production in the cultures without anaerobic enrichments. H2 (A), CO2 (B) and the main fermentation products acetate (C) and formate (D) where closed circles = Chlorella vulgaris and no inoculum, closed squares = C. vulgaris, 2-bromoethanesulfonic acid (BESA) and no inoculum, closed triangles = Dunaliella tertiolecta and no inoculum, and crosses = D. tertiolecta, BESA and no inoculum. H2 was produced in all cultures including the controls on day 1. With glucose in particular, high levels of H2 were produced during first few days. Over time H2 decreased to undetectable levels in all cultures except those with algal biomass without inoculum and cultures with glucose and B-D. In the other cultures H2 was consumed due to interspecies H2 transfer, and cumulative H2 production from algal biomass with the anaerobic inocula was negligible (Table 1). With no anaerobic inoculum, H2 production was higher from D. tertiolecta biomass, 8.4 and 12.6 ml H2/g volatile solids (VS), than from C. vulgaris biomass, 7.9 and 10.8 ml H2/g VS, with and without BESA, respectively. Further enhancement of H2 production was attempted by using these cultures as inoculum in batch incubations, but after four enrichment steps no increase in H2 production was detected. No CH4 was produced in the cultures amended with BESA (Figure 2). A significant amount of CH4 was produced only with C. vulgaris and U-C, glucose and U-C, and glucose and U-D (Table 1). Some CH4 was also produced with D. tertiolecta and U-D as well as with chitosan and U-C (Table 1). CH4 production from cellulose was negligible. CH4 production from chitosan was significantly lower than that from microalgal biomass. Gas production in controls with no substrate but inoculum was very low, and was taken into account in calculation of the gas production yields (Table 2). Thus, CH4 was produced from both C. vulgaris and D. tertiolecta biomass, while the yield was substantially lower with D. tertiolecta than with C. vulgaris (Table 2). With C. vulgaris biomass 30.6% of organic carbon was released as CH4 and 13.6% as CO2, while with D. tertiolecta biomass the corresponding values were 5.2 and 2.6%, respectively. CH4 production from C. vulgaris biomass was higher than in glucose controls, while CH4 production from D. tertiolecta remained far below that of the glucose controls. With glucose, cellulose or chitosan, the H2 production was generally higher with the B-D enrichment than with the B-C enrichment, but CH4 production was generally higher with the U-C enrichment than with the U-D enrichment (Table 1). aWhere x is CH4 or H2, as indicated.bH2 yield per g removed CODtot could not be calculated as no CODtot reduction was detected. BESA = 2-bromoethanesulfonic acid; CODtot = total chemical oxygen demand. The average chloride ion concentration in the anaerobic incubations was 0.7 and 4.8 g/l and sodium ion concentration was 2.3 and 2.1 g/l in bottles with C. vulgaris and D. tertiolecta as the substrate, respectively. The pH of the medium was not adjusted at the beginning of the anaerobic incubation. The initial pH was 8.0 in the cultures with algal biomass and 8.5 with the other substrates and the cultures with no substrate. With no substrate, cellulose and chitosan the pH changes were minimal, pH ranging from pH 8.0 to 8.5 during the incubation. With algal biomass, but no inoculum the pH varied between 7.5 and 8.0. With C. vulgaris and U-C the pH was 7.5-8.0, with C. vulgaris and B-C 7.0-8.0, with D. tertiolecta and U-D 8.0-8.5, and with D. tertiolecta and B-D 7.5-8.0. In cultures with glucose the pH varied between 6.0 and 8.5. Organic acids accumulated in the cultures with the B-C and B-D enrichments as well as in the cultures with no anaerobic enrichment inoculum. In the cultures inoculated with U-C and U-D organic acids accumulated only at the beginning of the incubation and were later reduced to CH4 (Figure 2C,D). In some cultures, such as with C. vulgaris and U-C, the volatile fatty acids (VFA) and ethanol concentrations were lower on day 49 than on day 0 (Table 1). The total concentrations of the soluble degradation products were lower with D. tertiolecta than with C. vulgaris (Table 1). The main VFA in the anaerobic inocula were acetate and propionate (Figure 2C,D), and acetate and formate in the cultures with no inoculum (Figure 3C,D). The initial total chemical oxygen demand (CODtot) values were significantly higher in cultures with C. vulgaris than with D. tertiolecta in spite of identical initial concentrations of algal VS in all cultures. The addition of 20 mM BESA also increased the initial COD concentration. The CODtot concentrations decreased in all cultures between days 0 and 49, except in the case of no substrate and in cultures with C. vulgaris, BESA and no inoculum. The decrease in CODtot was greater in bottles with U-C and U-D than with B-C and B-D as inoculum, respectively (Figure 4A). CODtot reduction was 52% with C. vulgaris and U-C, and 57% D. tertiolecta and U-D, but only 21% with C. vulgaris and B-C, and 15% with D. tertiolecta and B-D, respectively. The ratio of soluble COD (CODs) to CODtot decreased with CH4 production, but increased in the other cultures (Figure 4B). The COD results were in line with the VFA and alcohol results. Chemical oxygen demand (COD) concentrations in cultures with algal biomass. Total COD (CODtot) concentrations and the percentage of soluble COD (CODs) at the beginning and end of the cultivation in the cultures with Chlorella vulgaris and Dunaliella tertiolecta biomass. Based on bacterial PCR-DGGE and sequencing, the initial anaerobic inoculum contained bacteria belonging to phyla Firmicutes, Bacteroidetes, Proteobacteria and Chloroflexi (Additional file 2, Table S2). No genus and species level information for these bacterial sequences were obtained from GenBank. The bacterial community became enriched during the ten serial batch incubations. Bacterial DGGE profiles were different with the two algal biomass types. The addition of BESA also affected the bacterial community composition (Figure 5). For example, bands B13 and B29 were only clear with C. vulgaris and B-C, but not with C. vulgaris and U-C. Further, bands B18 and B21 were only clear in C. vulgaris and U-C, but not with C. vulgaris and B-C. In addition, bands B30-B33 were present in cultures with D. tertiolecta, but no corresponding bands were seen in cultures with C. vulgaris (Figure 5). Polymerase chain reaction-denaturing gradient gel electrophoresis (PCR-DGGE) profiling of the cultures with algal biomass. 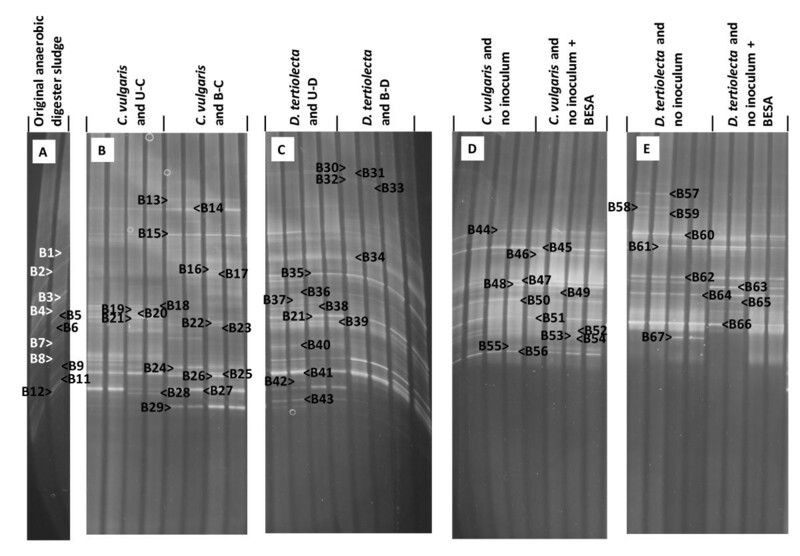 Bacterial community profiles from the original anaerobic digester sludge (A), Chlorella vulgaris enrichment cultures (B), Dunaliella tertiolecta enrichment cultures (C), C. vulgaris associated bacteria (D) and D. tertiolecta associated bacteria (E). See Additional files 2, 3, 4 for the labeled bands. Most of the bacterial 16S rDNA sequences amplified from the anaerobic enrichments matched uncultured bacteria with no species-level information (Additional file 3, Table S3). The matches in the enrichments were Petrimonas spp. (band B14), Bacteroides spp. (B15), Bilophila wadsworthia (B26), Wolinella succinogenes (B34), Oceanibulbus indolifex (B35), and Syntrophobacter spp. (B39). Petrimonas spp. were present in all cultures with C. vulgaris and anaerobic inoculum, B. wadsworthia in C. vulgaris and B-C and Bacteroides spp. in C. vulgaris and B-C as well as in the duplicates of D. tertiolecta and U-D. W. succinogenes, O. indolifex and Syntrophobacter spp. were present in all cultures with D. tertiolecta and anaerobic inoculum (Figure 4). A high diversity of bacteria was also present in cultures with no anaerobic inoculum (Figure 4 and Additional File 4, Table S4). These bacteria included Acidobacterium spp. (band B44), Clostridium spp. (B45, B46, B47, B61), Clostridium celerecrescens (B48, B63), Brevundimonas spp. (B49), Hafnia alvei (B50, B54), Hafnia alvei or Obesumbacterium proteus (B51), Gordonia terrae (B56), Clostridium sulfidigenes (B57, B58, B59, B60), Oceanibulbus indolifex (B62), Roseobacter spp. (B65), Exiguobacterium spp. (B66), Bacillus thermoamylovorans (B67) and four unknown species (B52, B53, B55, B64). The DGGE profiles of bacteria associated with C. vulgaris and D. tertiolecta biomass were different. For example, H. alvei was seen only with C. vulgaris, whereas C. sulfidigenes and B. thermoamylovorans only with D. tertiolecta. In cultures with C. vulgaris, addition of BESA resulted in negligible changes in the bacterial DGGE profile. The only detectable difference was B54 that was identified from the cultures with BESA, but not in the cultures without BESA. In cultures with D. tertiolecta, bands B57, B58 and B67 were only visible in cultures without BESA and B63 was significantly brighter with BESA in the medium. Analysis of archaeal 16S rRNA gene sequences was not undertaken in this study. 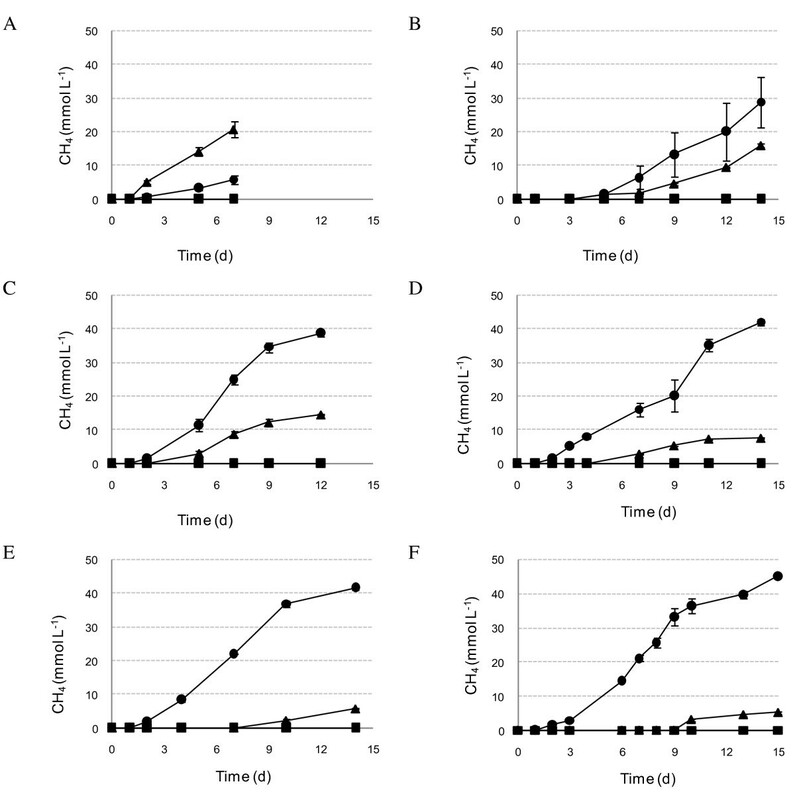 This work has demonstrated CH4 production from C. vulgaris and D. tertiolecta biomass when inoculated with municipal anaerobic digester sludge enrichments. Biogenic H2 was also produced, but it was subsequently consumed without CH4 production. H2 was produced also in the cultures with algal biomass but no anaerobic inoculum. H2 was produced from both C. vulgaris and D. tertiolecta biomass by the H2 enrichment cultures (containing BESA), but it was subsequently consumed by non-methanogenic microorganisms. The pH was relatively high in these assays. In the cultures with added anaerobic inoculum, H2 production was most sustained in the positive controls with glucose, where the pH was also the lowest. Karadag and Puhakka  showed with an anaerobic, moderately thermophilic (45°C) enrichment culture that the pH significantly affected H2 production from glucose due to pH mediated shifts in fermentation pathways and the bacterial community composition. They reported pH 5.0 was optimal for H2 production. In the present work, several bacteria were identified from the anaerobic inoculum and algal biomass. These included Petrimonas spp. that have been previously shown to produce H2 . Syntrophobacter spp. have been shown to convert propionate to acetate, H2 and CO2, but only when cocultivated with H2-consuming organisms [20, 21]. B. wadsworthia and W. succinogenes utilize H2 as their electron donor [22, 23]. According to Chassard et al. Bacteroidetes spp. can suppress H2 production from cellulosic material in a mixed culture because they are non-H2-producing bacteria with a relatively high cellulolytic activity. O. indolifex is an obligately aerobic marine bacterium  with no activity under anaerobic conditions and thus it originated from the algal biomass slurry. H2 accumulated in the cultures supplemented only with algal biomass. These cultures formed CO2 and accumulated organic acids and alcohols. Gfeller and Gibbs , Miura et al. and Ueno et al. reported hydrogen fermentation by microalgal cells under dark and anaerobic conditions, with H2 yields up to 2 mmol H2/g dry weight . In this study, H2 yields were approximately 25% of that in the cultures with no added anaerobic inoculum (Table 2). However, the DGGE profiles had matches with several H2-producing bacteria such as Clostridium spp. [26, 27] and Hafnia alvei , which are known H2 producers. Some Bacillus spp., such as B. cereus, B. thuringiensis  and B. megaterium  also produce H2. According to Combet-Blanc et al. , B. thermoamylovorans does not produce H2. O. proteus is typical in breweries and is known to cause beer spoilage . Some Exiguobacterium spp. such as E. profundum are facultatively anaerobic and produce lactate as the main fermentation product . Carver et al. used the same algal biomass stocks but a different source inoculum to monitor metabolite production under thermophilic (60°C) conditions. 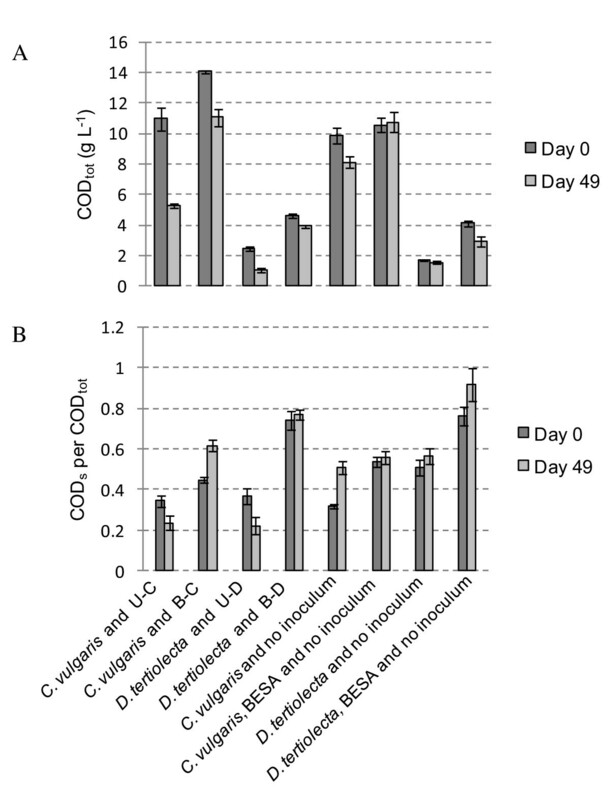 They reported H2 production without anaerobic inoculum by heterotrophs associated with C. vulgaris biomass, but low H2 production with heterotrophs associated with D. tertiolecta. In the present study, the D. tertiolecta-associated bacteria produced somewhat more H2, but approximately 4.5 times less VFA and alcohols and approximately 3 times less CO2 than the C. vulgaris-associated bacteria. The higher H2 production from D. tertiolecta was likely due to the lack of proper cell wall in D. tertiolecta and differences in bacterial composition of the algal biomass slurry. However, the H2 yields reported in this study were low. For comparison, Park et al. reported the production of 28 ml H2 per g dry weight of the macroalga Laminaria japonica pretreated by ball milling and heat treatment at 120°C for 30 min using anaerobic sewage sludge as an inoculum. Carver et al. reported production of 82 and 114 ml H2/g VS from C. vulgaris and 39 and 58 ml H2/g VS from D. tertiolecta by only microalgal associated bacteria and by a thermophilic consortium at 60°C, respectively. In the cultures with no added anaerobic inoculum, H2 production was somewhat lower with BESA in the medium. This indicates that BESA was inhibitory to some bacteria involved in fermentation. Bacteria present in cultures with no added anaerobic inoculum were associated with the algal culture or were introduced during handling of the biomass. CH4 was produced from both C. vulgaris and D. tertiolecta biomass, but the yields were not comparable. CH4 production was approximately 12 times higher from C. vulgaris than from D. tertiolecta per added VS but only approximately 3 times higher per added or removed CODtot (Table 2). Based on the chemical composition (protein, lipid and sugar content) of the two algal biomass feedstocks, theoretical CH4 yield according to Sialve et al. would be 463 and 261 ml CH4/g VS from C. vulgaris and D. tertiolecta, respectively. The CH4 yields obtained (286 and 24 ml CH4/g VS) were 62% and 9% of the theoretical for C. vulgaris and D. tertiolecta, respectively. However, the cellular composition and major cellular fractions are greatly influenced by storage and culture conditions and cell age. Storage enhances cellular leakage, which was more pronounced with D. tertiolecta than with C. vulgaris. Based on Becker , C. vulgaris composition varies on average in the range of 51% to 58% protein, 14% to 22% lipids, and 2% to 17% carbohydrate on dry weight basis. Sydney et al. reported 29% proteins, 11% lipids and 14% sugars for D. tertiolecta and the closely related D. salina contains 57% protein, 6% lipids, and 32% carbohydrate . Additional file 1, Table S1 is a compilation of composition data pooled from specific studies; it is apparent that the bulk cellular composition is a variable parameter. The large difference in CH4 production between the two algal biomasses was likely due to inhibition of digester sludge enrichment by the salinity in the marine D. tertiolecta slurry flocculated with NaOH [6, 35, 38]. Salt toxicity towards methanogens is generally caused by the cation portion of the salt , which in this case is Na+. For example, McCarty  has reported 3.5 to 5.5 g/l Na+ to be moderately toxic and concentrations above 8 g/l highly toxic to methanogens. Similarly, high Cl- levels can also cause inhibition of non-marine methanogens. The levels of dissolved Na+ in cultures with D. tertiolecta in this study were 2.1 g/l indicating non-toxic levels of Na+. However, Cl- concentration was significantly higher in cultures with D. tertiolecta than with C. vulgaris as the feedstock. It was also clearly seen from freeze-dried D. tertiolecta that salts were bound on the surface of the biomass. Similar salt precipitation was not seen in C. vulgaris biomass. Another reason for low CH4 production from D. tertiolecta biomass may be that W. succinogenes was identified from cultures with D. tertiolecta and U-D, but not from cultures with C. vulgaris and U-C. Coexistence of W. succinogenes has been reported to markedly reduce CH4 production . Chen and Oswald  reported 320 ml CH4/g VS from biomass of a mixed microalgal culture from high-rate sewage stabilization ponds heat treated at 100°C for 8 h. Yen and Brune  reported 143 ml CH4/g VS from an algal mixture including Scenedesmus spp. and Chlorella spp. without pretreatment. Thus, the CH4 yield achieved from C. vulgaris was comparable with previous results, but the yield from D. tertiolecta was very low. C. vulgaris biomass also contained some chitosan, used in flocculation of the biomass. Co-digestion of algal biomass (N-rich material) with C-rich material such as cellulose or chitosan may enhance digestibility . However, the anaerobic enrichments used in this study were not able to utilize chitosan very efficiently. Thus the co-digestion effect was negligible and CH4 was mainly produced from the algal biomass. The calorific yields calculated for the maximum H2 and CH4 yields were 0.14 kJ/g VS (for H2 production from D. tertiolecta without added anaerobic inoculum) and 10 kJ/g VS (for CH4 production from C. vulgaris with enriched digester sludge without BESA). Hydrolytic pretreatment of algal slurries could substantially improve H2 production from complex biomass substrate. C. vulgaris biomass was shown to be amenable to methanogenic digestion without pretreatment, whilst the high salt content of D. tertiolecta biomass likely lowered the CH4 yields. However, based on CODtot, approximately 50% of C. vulgaris biomass was degraded during methanogenic fermentation. Therefore, pretreatment could also enhance CH4 production from the biomass of thick cell walled algae, such as C. vulgaris, but the energy cost of the pretreatment need to be considered. CH4 was produced from C. vulgaris and D. tertiolecta biomass by mesophilic municipal anaerobic digester sludge enrichments. H2 was also produced with the anaerobic enrichments but was concurrently consumed by non-methanogenic microorganisms. H2 was produced by satellite bacteria associated with algal biomass. PCR-DGGE profiling demonstrated the presence of H2 producing (for example, Petrimonas spp., Syntrophobacter spp.) and H2 consuming bacteria (for example, Bilophila wadsworthia, Wolinella succinogenes) in the anaerobic enrichments and H2 producing bacteria (for example, Clostridium spp., Hafnia alvei) among the satellite bacteria of both microalgal biomasses. H2 production by the satellite bacteria was comparable from D. tertiolecta and from C. vulgaris, but CH4 production by the anaerobic enrichments was substantially higher from C. vulgaris than from D. tertiolecta. The CH4 yield obtained from D. tertiolecta biomass with the inoculum originating from anaerobic digester was likely limited by the high salinity of the biomass, while the low protein, lipid and carbohydrate content of the D. tertiolecta further lowered the CH4 yield. Chlorella vulgaris (Culture Collection of Algae and Protozoa, UK strain 211/11B) and Dunaliella tertiolecta (Sammlung von Algenkulturen Göttingen, Germany, strain SAG 13.86) were grown photoautotrophically in 20 l column (diameter 0.16 m) photobioreactors with 0.5 vvm air sparging and photosynthetically active radiation at photon flux density averaging 225 μmol/m2/s. C. vulgaris was grown in milliQ-water-based Jaworski's medium (http://www.ccap.ac.uk/media/recipes/JM.htm) and D. tertiolecta in natural seawater from the Menai Strait, UK, treated by filtration (0.2 μm) and UV irradiation, with nutrients supplied according to Walne's medium (http://www.ccap.ac.uk/media/documents/Walnes.pdf). Algal biomass was harvested from 20 l cultures by flocculation followed by centrifugation. C. vulgaris was harvested by adding a chitosan stock solution (4 g chitosan, 50 ml acetic acid, 950 ml water) to the culture at approximately 2% of the total volume and adjusting pH to 7 by adding 3 M NaOH to initiate the flocculation. D. tertiolecta was flocculated by adding 50-100 ml of 3 M NaOH to raise the pH to approximately pH 9.5 . The biomass of both species was then collected and centrifuged at 1,000 g for 10 min to produce a thick paste. The pH of C. vulgaris and D. tertiolecta biomass was adjusted to 7.0 ± 0.2 with HCl and the biomass slurries were stored at -20°C until used in the gas production experiments. The algal biomass stocks were normalized by measurements of VS.
Anaerobic inocula were enriched from an anaerobic digester treating municipal wastewater sludge (City of Tampere, Finland). Serum bottle enrichments were prepared as series of batch incubations at 37°C with 5 g VS/l of substrate. In the first three phases the substrate consisted of 25% (VS/VS) algal biomass and 75% (VS/VS) of activated sludge, followed by 50% of algal biomass and 50% of activated sludge, and finally 75% of algal biomass and 25% of activated sludge. In the following enrichment phases, 100% of algal biomass was used. Four different cultures were enriched. Two H2-fermenting cultures, one with C. vulgaris biomass, designated as B-C, and one with D. tertiolecta biomass as the substrate, B-D, and two CH4-producing cultures, one utilizing C. vulgaris biomass, U-C, and one D. tertiolecta biomass, U-D. Methanogenesis was suppressed in the H2-fermenting cultures by addition of 20 mM BESA. The medium was prepared according to Zehnder et al. with modifications by Karlsson et al. and Ejlertsson et al. .
Gas production potential from C. vulgaris and D. tertiolecta was studied after nine passages of the corresponding enrichment culture at 37°C in 120 ml anaerobic serum bottles with 50 ml of medium and 10% (v/v) inoculum. The incubations included two types of negative controls, with inoculum but no substrate and with 5 g VS/l algal biomass but without anaerobic enrichment inoculum. Three types of positive controls were prepared containing enriched anaerobic inoculum and either 5 g/l glucose, 5 g/l cellulose or 5 g/l chitosan. The VS concentrations of the biomass samples were measured according to the Finnish Standard SFS 3008 . Carbon and nitrogen were measured with Thermo-Electron Flash EA 1112 after drying the samples at 80°C for 72 hours. The elemental analyzer was calibrated using the standards sulfanilamide, 2,5-bis(5'-tert-butyl-benzoxazolyl)thiophene and l-cystine. dl-methionine was used as a reference material. Mass composition of the two microalgal biomass feedstocks was determined with analytical methods generally used in microalgal studies and at least three replicate samples were included in all analyses. The total lipid content of biomass was measured by extracting the lipids from freeze-dried biomass with chloroform/methanol and determining the lipids gravimetrically . The protein composition of the algal biomass was calculated by multiplying the total elemental nitrogen content by 4.44 . Total carbohydrate concentration of the biomass feedstocks was determined by the phenol sulfuric acid method . Prior to biomass analyzes D. tertiolecta biomass was washed with 0.5 M ammonium formate. Gas production was measured according to Owen et al. . The headspace gas composition (H2, CH4 and CO2) was measured using Shimadzu gas chromatograph GC-2014 equipped with Porapak N column (80/100 mesh) and a thermal conductivity detector. The temperatures of the oven, injector and detector were 80, 110 and 110°C, respectively. N2 was used as carrier gas at a flow rate of 20 ml/min. The formation of organic acids and alcohol (lactate, formate, acetate, propionate, butyrate and ethanol) was analyzed with a Shimadzu HPLC chromatograph with a Shodex Sugar SH1011 column (Showa Denko K.K., Tokyo, Japan) and a refractive index detector (Shimadzu, Kyoto, Japan). Mobile phase was 5 mM H2SO4 and flow rate 0.9 ml/min. COD was analyzed before (CODtot) and after filtration (CODs) through 0.45 μm polyester syringe filter (Macherey-Nagel, Düren, Germany) with dichromate method according to standard SFS 5504 . Concentration of dissolved chloride ions was analyzed with Dionex DX-120 ion chromatograph equipped with AS40 auto sampler and IonPac AS23 (4 × 250 mm) anion exchange column. The mobile phase was Na-carbonate/Na-bicarbonate solution containing 4.5 mM/l Na2CO3 and 3 mM/l NaHCO3. Concentration of dissolved sodium ions was analyzed with inductively coupled plasma emission-mass spectrometry according to industry standard DIN EN ISO 17294. Duplicate samples of 1.5 ml were taken from the original digester sludge and from batch bottles at the end of the 49-day incubation and stored at -20°C. Prior to DNA extraction samples were pelleted by centrifugation (10,000 g, 5 min) and the supernatant removed. DNA was extracted from the pellets with PowerSoil DNA isolation kit (MO BIO Laboratories, Inc., Carlsbad, CA, USA). The extracted DNA sample was used as a template for the PCR. Partial bacterial 16S rRNA genes of the community DNA were amplified by using primer pair GC-BacV3f  and 907r  as described by Koskinen et al. . DGGE was performed with INGENYphorU2×2-system (Ingeny International BV, GP Goes, The Netherlands) using 8% polyacrylamide gels with denaturing gradient from 30% to 70% (100% denaturing solution contains 7 M of urea and 40% formamide). Gels were run at 60°C in 1 × TAE (40 mM Tris, 20 mM acetic acid, 1 mM ethylenediaminetetra-acetic acid (EDTA), pH 8.3) with 100 V for 22 h and stained with SYBR Gold (Molecular Probes Invitrogen, Eugene, OR, USA). The dominant bands were excised from the gels, eluted in 20 μl of sterile water at 4°C overnight, stored at -20°C and reamplified for sequencing. Sequencing was conducted at Macrogen Inc. (Seoul, Korea). Sequence data were analyzed with BioEdit software and compared with sequences in GenBank. Cumulative H2 and CH4 production were calculated according to Logan et al. . The data were fitted to a modified Gompertz equation  by minimizing the square of the measurements and the estimates subtraction to give lag times and H2/CH4 production rates. The calorific yields from maximum H2 and CH4 yields were calculated from the lower heating values, 120 MJ/kg for H2 and 50 MJ/kg for CH4. This research was funded by the Finnish Funding Agency for Technology and Innovation (Finland Distinguished Professor Program, 402/06), Academy of Finland (Finland Distinguished Professor Program) and EPSRC (UK) Industrial Case Award with RWE nPower. We would like to thank Dr Elena Efimova for assistance with the lipid analyses. AML carried out the anaerobic cultivations and all related analyses, microbial community analyses, data interpretation, and drafting and completion of the manuscript. CJH carried out microalgal biomass production and harvesting, and the elemental analysis of the harvested biomass and participated in the drafting of the manuscript. DNT participated in the design of microalgal biomass production and reviewed the manuscript. OHT participated in the design of the study and data interpretation, and thoroughly reviewed the manuscript. JAP conceived the study, participated in data interpretation and thoroughly reviewed the manuscript. All authors read and approved the final manuscript.